I’m using this blog as a tool to integrate a realistic version of my own history with my current life, including any resonant digressions. I see how my history infuses my present. Sometimes I follow currents relating to my past, present and future uses of media for personal self-expression and social change, or just general media study. Sometimes it has nothing to do with media, in actuality I might just write whatever comes to mind. I’m fascinated to be learning about the role of Grandmother, and I’ve written this short piece on Becoming a True Grandmother by Carol Sill as an introduction to my approach to this. Carol Sill has been involved in interactive digital media since the mid-90s. Her background includes international broadcast and non-theatric distribution, new media education and independent production. She currently does editorial, publication and research work. She taught for many years at Vancouver Film School New Media, developing curriculum and courses that ranged from Writing for Interactivity and Preproduction to Proposal Writing and Marketing. She also taught several Writing courses at Langara College. 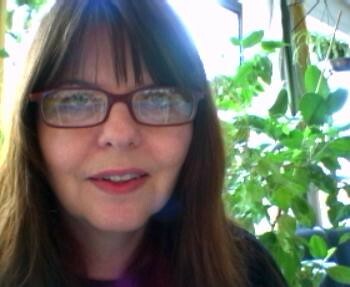 She wrote and co-produced Electric Living in Canada, an interactive DVD-ROM overview of digital culture involving interviews with 100 digital artists and media theorists. Her collages have been shown in two Digitalis exhibitions: The Spiritual in Digital Art and Urban Poetry. She is also a graduate of trade Publishing Intensives in Book Publishing and Book Editing (SFU), and Magazine Publishing (Banff Centre). She founded Alpha Glyph Publications, Ltd. to provide comprehensive 21st century editorial and publishing services for unique niche-market publications in print and other media. In addition to her formal education, she has studied the work and methods of Marshall McLuhan informally, first with Barrington Nevitt and continuing the conversation from time to time with Eric McLuhan, along with independent study. Sufi study and practice was catalyzed and mentored by Shamcher Beorse, Pir Vilayat Khan, and Hidayat Inayat Khan. She has participated in Buddhist study and practice with Geshe Kaldan, as well as taking part in sweat lodges, dances of universal peace, zen meditation and yoga disciplines. One of the founders of Lake O’Hara Camp, an annual sufi event which lasted over 21 years, she also founded and encouraged the development of sufi centers in Western Canada, teaching meditation in the open tradition of Inayat Khan. Ordained to perform Universal Worship, she provides services for weddings, funerals, baby blessings and house blessings. Personal publications include Letters, Documentary Print, Human Ecology: Notes on the Sacred Element Work, and An Interview with Shamcher Beorse. She currently manages the digital site for Shamcher Archives. She lives in Vancouver BC with her husband, the abstract artist James K-M. Thought you might want to know, they are currently cutting down the trees on the 200 block in front of Bodega Studios. Have just scanned your posts, or which of them I’m able to figure out. So sorry about your mother. That’s always a chapter closed in a person’s life, when a mother passes away. I have just checked my blog and will see about making it into something. Saw the Julia and Julie movie which did motivate me. Summer is hot and sometimes very tiring, so I have not been writing. So if you have any time I’ll be a good little student and do all my homework.